Former President, Olusegun Obasanjo on Thursday said he has reversed his disposition towards People’s Democratic Party (PDP) Presidential candidate, Atiku Abubakar, as he endorsed the former Vice President to clinch the top political office; addressing him as President-to-be. Atiku visited Obasanjo visited him at his Abeokuta home, alongside some men of God like Bishop David Oyedepo and Bishop Mathew Kukah. Special Adviser to the President on Media and Publicity, Femi Adesina, has on Thursday declared that no gang up against the second term bid of President Muhammadu Buhari will not stand. 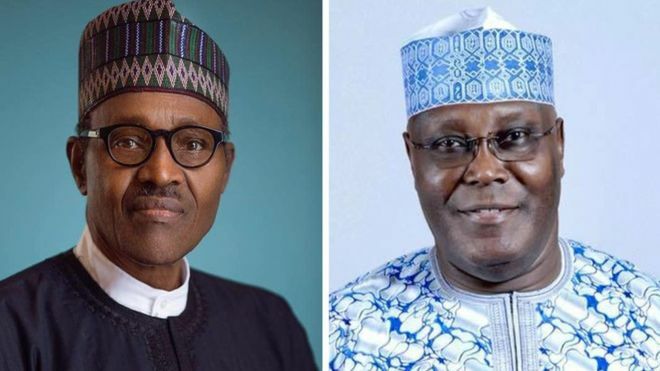 Adesina disclosed this on his Twitter handle, shortly before the People’s Democratic Party (PDP) Presidential candidate and former Vice President, Atiku Abubakar received forgiveness and had his Presidential bid endorsed by his erstwhile boss, former President Olusegun Obasanjo, in Abeokuta. “The harder they come, the harder they fall. 2019 presidential election on my mind,” Adesina tweeted. The Senate on Thursday approved the sum of N234 billion for the Independent National Electoral Commission (INEC) in the 2018 budget for the conduct of the 2019 elections. The approved figure comprises the N189 billion requested by INEC to conduct the 2019 general elections which is to be vired from both recurrent and capital components of the Special Intervention Programme captured in the Service Wide Vote of the 2018 Appropriation Act, while N45 billion provided for the commission under statutory transfer. The ruling All Progressives Congress (APC) on has emerged victorious in the Plateau local government elections conducted in the state. According to the results announced by the Chairman of the Plateau State Independent Electoral Commission, Fabian Ntung, on Thursday, the APC won in all 13 Local Government Areas of the state while the results in two Local Government Areas of Mangu and Lantang North were inconclusive due to irregularities and violence during voting. The results declared also indicated that the opposition People’s Democratic Party (PDP) won six councillor seats and no local government chairmanship,while the remaining 204 councillor seats were won by the APC. Speaker of the Ekiti House of Assembly, Hon. Kola Oluwawole and his deputy, Sina Animasun were on Thursday impeached by 14 members of the house. The 14 lawmakers who cited abuse of office and mismanagement of the resources of the House among other reasons for their actions, consequently elected Adeniran Alagbada representing Ise constituency as the new speaker and Segundo Adewunmi as his deputy while some members of the house members were also suspended. Seventeen people have been sentenced to death by an Egyptian military court over their involvement in bomb attacks on Coptic Christian churches.